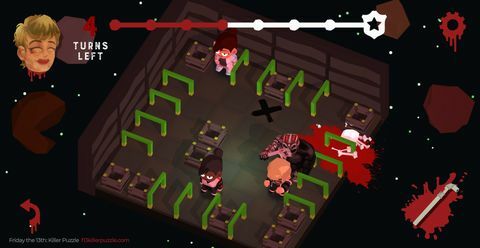 Friday the 13th: Killer Puzzle is a simple puzzle game that - for some reason - is wearing the skin of a slasher / horror film. Were the presentation to take another form, it would be more widely recommendable; as it stands, however, the game seems to squarely target a niche of gamers that like simple puzzles AND gore - at the same time. The theme is based on the Friday the 13th films, a storied franchise that depicts the age old battle between teenagers and deadly murderous creeps at halloween. 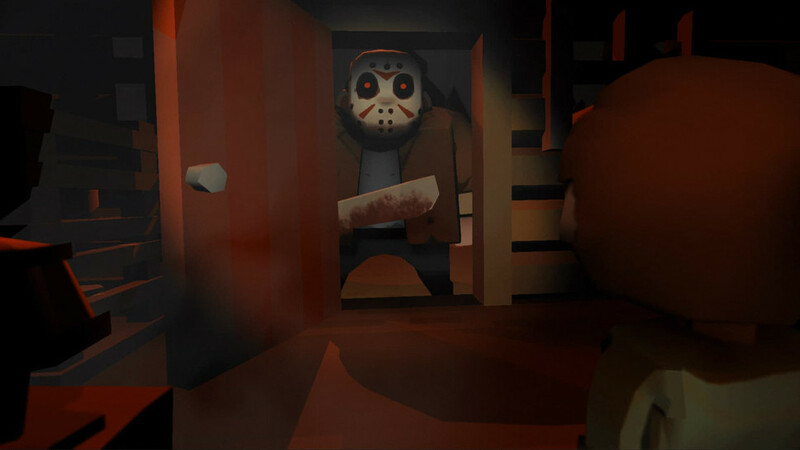 Rather than take on the villainous Jason, however, you play as him, and must murder your way through a variety of children, prisoners, cops, and random other folk who dare to exist and - by doing so - prevent you from exiting the level (until they stop existing). 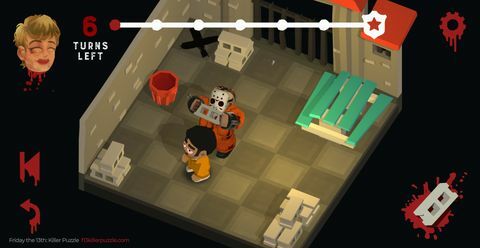 To perform the murderous rampage each level requires of you, you must slide Jason on a puzzle grid - as soon as you send him in a direction, he’ll keep moving that way until he is stopped by an obstacle or the edge of the level. 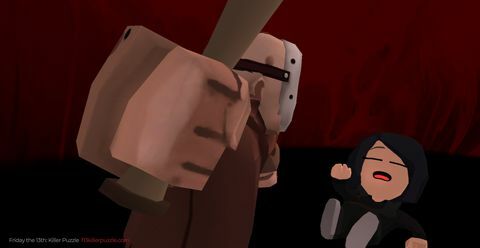 This movement mechanic remains at the heart of the puzzle, as you must determine how to manipulate Jason so that he kills the various people a level is populated with while also setting you up so that you can make the next move you need to - if you don’t pre-plan, you’ll find yourself unable to clear the level and will need to restart. Your prey will flee in certain circumstances, a behaviour you’ll need to take advantage of in order to manipulate the level into a completable state, and some levels limit the number of turns you can take. Not that it always matters if you can’t complete a level - not only can you skip most levels but you can also have the solution revealed to you move by move, leaving the only challenge as one of remembering the steps you need to take - rather than actually figuring them out. Relying on this as a crutch is inadvisable, however, as the challenge levels remove this ability entirely and if you haven’t learned how to play the game by the time you try to tackle them, well, good luck with that. Eventually, the designs become so devious and the combination of simple mechanics so complex that even the most seasoned puzzle vets will (probably) falter. The complexity ramps up over time with more deviously designed levels and an array of traps etc that can actually kill Jason himself. Eventually, the designs become so devious and the combination of simple mechanics so complex that even the most seasoned puzzle vets will (probably) falter. I say “probably” there as i’m not one of them and I faltered earlier than they (you?) will. It takes a while to get to this point, however, so beginners need not fret, as the difficulty ramp is a mostly enjoyable one. The gore aspect is brutal and basically implemented, underlining the strange juxtaposition between gameplay and presentation. You often unlock different weapons to equip, with seemingly anything from bats and knives and swords to brooms and scythes and fish able to be used to bludgeon or slice open your victims. These unlocks seem to be exclusively for comedic effect, as they had no apparent impact other than changing the method by which Jason dispatched his “enemies”. Ignoring the blood, another aspect of the visual package that merits discussion is the camera. 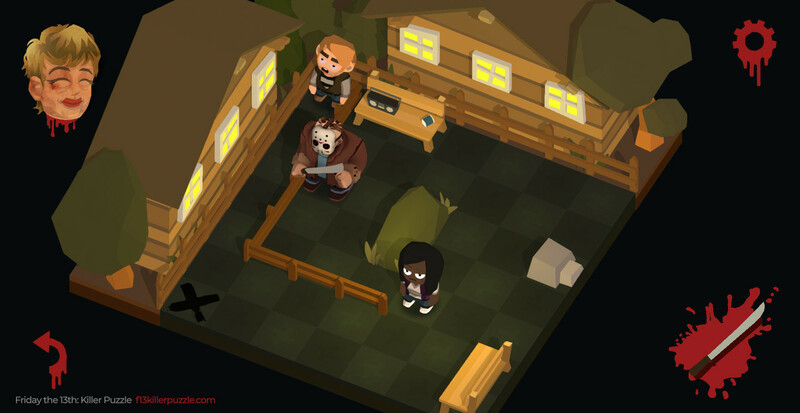 Presented from an isometric view, likely in order that you can see more detail in the characters and world of the game, Killer Puzzle would clearly be more playable were the level presented top-down. As the complexity ramps up, so does the detail in the layout of each puzzle, increasing the likelihood that you’ll miss an obvious solution because it’s not clear that a path is (or is not) blocked by an object. It’s not catastrophic, as I feel it is in Bomberman, since you can roll back a move without penalty, but it does seem like a decision made for the benefit of the visuals at the expense of the gameplay. 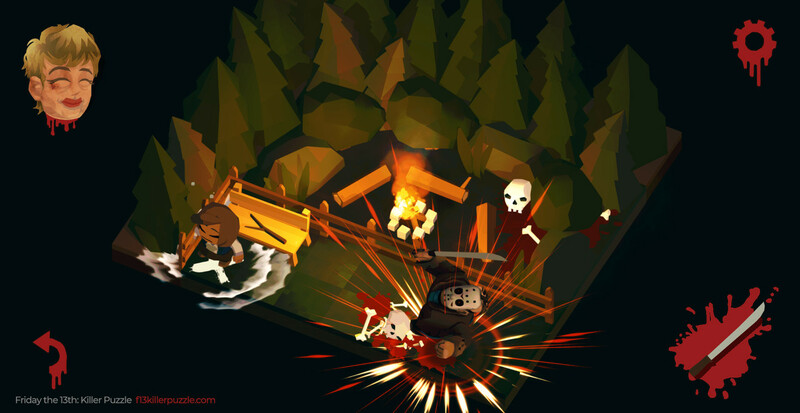 Friday the 13th: Killer Puzzle is a decent puzzle game enmeshed in an odd / ill-fitting license. The less charitable might suggest that the combination is more about courting controversy than it is about appropriateness for the genre, but wherever you stand on that is moot really - it exists and how you react to that is up to you. Me? I’m not overly fond of it, and will stick to getting my puzzle fix from the likes of the Picross series on Switch. Friday the 13th: Killer Puzzle is a curious marriage of gore and puzzles which unfortunately doesn't quite it right. Fans of the franchise will get more enjoyment than others, but it's hard to recommend this puzzler to any but the most die-hard Vorhees fans. Ups Good to see a license approached in a non-obvious way. Puzzle mechanic is surprisingly deep. Downs Gore seems oddly out of place. Camera can conceal solutions.